Deburring: A standard operation? - Sundown Mfg, Inc. According to LaRoux K. Gillespie, author of SME’s Deburring and Edge Finishing Handbook, a shop can establish its own deburring standard, with the absence of one official standard in U.S. industry. It’s just a matter of communicating the specifics of the final edge finish. Editor’s Note: The following is adapted from Chapter 2: “Plant Standards and Edge Needs” in SME’s Deburring and Edge Finishing Handbook, which can be ordered from www.amazon.com. Every plant has standards for burrs and edge finishing. In some plants standards may not be in written form, and they may vary from day to day and between individuals. In such plants there is some general understanding of allowable edge conditions. Some plants have comprehensive written standards. Typically, large companies will have detailed written standards because consistency is important, and written standards are the only way to ensure some measure of consistency throughout the plant. A few companies may have stringent process controls that provide the consistency. Standards are meant to make life easier for those who work in a specific field. They help to ensure a common level of performance and understanding. They do not, however, necessarily restrict users to a single solution. Many standards define multiple allowable levels or states. In addition, the multiplicity of standards in use testifies to the breadth of alternatives that can be tolerated when a single standard is not adequate. Most manufacturing and design personnel have encountered instances when their assumptions about edge quality differed markedly from others’. Such instances highlight the need for a common language within plants, between plants, and among individuals. If a design drawing only contains the words deburr or burr-free, does this mean “visible with the unaided eye” or “under magnification”? Does the fact that magnification is used on some parts in the plant imply any legal requirement that all parts must be finished to that same level of quality? The engineering answer is often different from the legal answer. Reference to a national standard or to comprehensive company standards prevents or greatly reduces such problems. Currently no globally accepted standard exists for burrs and edge finishing. Some nations, such as Japan and Germany, have their own standards. In the U.S. some industry segments, such as die casters and stampers, have association-generated standards, but these are not useful for job shops that serve customers across several manufacturing sectors. That’s why it behooves fabricating shops to create their own standards. If they choose to do this, here is what they should keep in mind. The company’s products or parts should take into account the effects of burrs and edges, and the company should provide appropriate actions and controls. Product designs should identify edge requirements, and the technical staff should be aware of those requirements. Corporate quality expectations drive this requirement. They provide a complete approach to defining edge conditions on product drawings. Manufacturing and inspection instructions and practice ensure that design requirements are met. Deburring is not required. All edges may be left as produced by the sequence of production processes used. Burrs or similar projections produced at edges may cause some dimensions to fall outside their normal limits. Whenever a drawing, purchase order, or specification fails to indicate specific edge finishing requirements, this level of edge finishing is implied. This level of edge quality allows producers to remove burrs and finish edges if they desire to do so. Remove sharp edges. Edges defined by this level of finishing will be smooth to the extent that hands will not be cut, nor will electrical wires or mating parts. Burrs still remain on the products; they may be beaten over, flattened, completely removed, or rounded. Remove all visible burrs. No projections visible to the unaided eye are permitted beyond the normal plane of adjacent surfaces. Small projections that are too small to be detected by normal unaided vision may remain. Any remaining material should not cause dimensions to fall out of drawing specifications. This specification level also requires that edges should not be sharp to the extent that they could cut hands, wiring cables, or mating parts. Remove all burrs visible at __ X magnification. No projections visible at __ X magnification are permitted beyond the normal plane of adjacent surfaces. Small projections that are too small to be detected by the indicated power of magnification may remain. This specification level also requires that edges should not be sharp to the extent that they could cut hands, wiring cables, or mating parts. This level of edge quality allows inspection by any quality of optics and any form of lighting. Tactile or other nonoptical inspection approaches are not allowed in this level of deburring. Break edges __ X __ mm minimum. Edges should be chamfered, blunted, or smoothed such that no material falls above a chamfer of the indicated minimum dimensions. Round edges __ to __ mm radius. Edges should have a curvature falling within the indicated limits. Chamfers are not acceptable. Do not deburr. Edges should be left as produced by the sequence that produced them. This statement explicitly prohibits deburring. This outline of deburring standards uses an ISO 9000 approach. Other methods of specifying edge finishing levels are acceptable as long as they leave no doubt about the intent of the requirement. Drawings for components requiring more than one edge finishing level must clearly indicate which requirement applies to which edges. Providing explicit notes on the drawing with arrows pointing to the edges involved is the most commonly used approach, but other approaches are acceptable. Design requirements drive the manufacturing requirements, which provide a complete approach to defining edge conditions for manufacturing operations. All new and current manufacturing instructions should conform to this requirement. Work instructions for burrs, deburring, and edge finishing should be written and provide adequate details so that those who perform any of the operations can understand the requirements and how to perform the work. Work instructions should ensure that drawing callouts and specifications are met or exceeded. When work instructions refer to machine operations, written details describing those operations should be provided. Operators should follow work instructions. Operators who deburr or finish edges should be trained, and a record should be kept of their training. The training provided should include all the elements specified on work instructions, machine operation procedures, and expectations and requirements. All equipment dials, gauges, and measuring devices should be calibrated to a set of written standards, and a record should be kept of such calibration. Figure 2 illustrates one acceptable approach for defining edge requirements in work instructions. This approach provides explicit instructions for edges to be deburred, size of final edge configuration, and the equipment to be used. In the absence of any specific deburring process described in manufacturing instructions, hand deburring should be used. 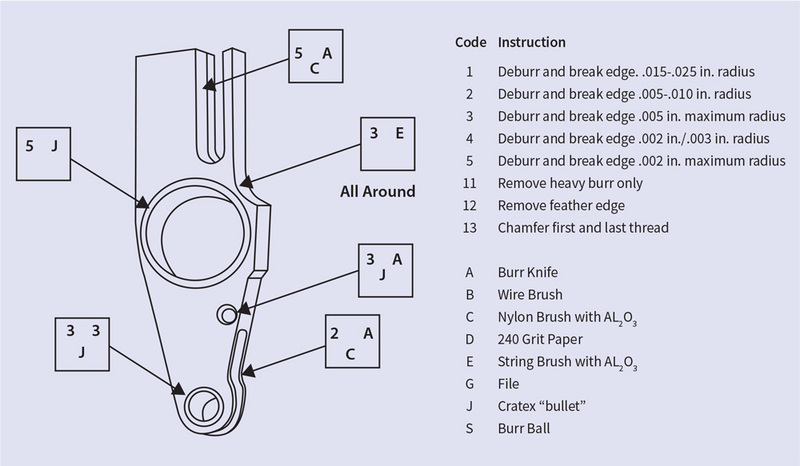 Whenever a technique is critical or its costs are clearly advantageous, the work instructions should specify those techniques to be used during deburring. Figure 3 defines the processes, calibration, and training requirements for deburring at a metal fabricating facility. Design requirements drive inspection requirements, which provide a complete approach to defining edge conditions for inspection. All new and current inspection instructions and practices should conform to this requirement. Instructions for inspecting for burrs, deburring, and edge finishing should be written and provide adequate detail so that those performing any inspections can understand the requirements, the measuring and recording devices, and how to perform the work. Instructions for inspection should ensure that drawing callouts and specifications are met or exceeded. When instructions for inspection refer to equipment operation, written details describing equipment operation should be provided by some means. Inspectors should follow inspection instructions. Inspectors who inspect for deburring and edge finishes should be trained, and a record kept of their training. Documentation that parts conform or do not conform to edge and deburring requirements should be maintained. In these work instructions, edge requirements are clearly defined. The presence of burrs on parts, the measurement of burr properties, edge configuration, and related items can be documented by many approaches. Any specific approaches required for specific edges or parts should be defined by inspection instructions. Unaided visual inspection. Unaided visual inspection recognizes that some personnel wear eyeglasses, and if these are normally required by the personnel, they should be classed as unaided. Visual acuity varies significantly among individuals, so absolute determination of burr-free conditions is not assured. Toothpick (tactile) inspection. Wooden toothpicks generally detect burrs and steps as small as 0.0005 in. Draw the end of the toothpick across the edge in question, slowly searching for a slight upward movement or a momentary stopping. Sharpness is detected by drawing the body of the wooden toothpick lightly over the edge; if any shavings appear, the edge is sharp. Shavings generally indicate that edge radii are approximately 0.001 in. or smaller. No. 2 pencil point inspection. Using the point of a sharpened No. 2 pencil, jab at the burr. If the point breaks off before the burr or any other material is broken free, the burr is assumed to be rigidly adhered. Fingernail inspection. Draw the end of the fingernail over the edges. If the fingernail hangs up, slows, or experiences a slight upward motion, a burr or raised metal exists at the edge. This technique often can detect burrs as small as 0.0005 in. high. Sharpness is detected by drawing the top surface of the fingernail lightly over the edge. If any shavings appear, the edge is sharp. Shavings generally indicate that edge radii are approximately 0.001 in. or smaller. 4X magnification. A 4X magnifying glass, with or without accompanying lighting, is used. Inspectors may wear eyeglasses in addition if they normally require these. Again, visual acuity varies significantly among individuals, so absolute determination of burr-free conditions is not assured. Microscope inspection. A stereozoom microscrope is used with associated lighting of any kind. Magnification of 10X is used if not otherwise specified. Microscopes should be in good working order and be maintained under a defined maintenance plan to ensure adequate optics quality. Borescope inspection. Borescopes should be used to inspect the hole interiors or other cavities not otherwise readily seen. Borescope inspection must be done by operators qualified in detecting burrs and associated edge conditions. Metallurgical mounts inspection. Metallurgical cross-sectional mounts are made only when specified or when other means are inconclusive. This is a destructive inspection. Height gauge inspection. Raised material and burrs may be detected by passing a height gauge and indicator over the edge. This approach requires several measurements along each edge. Careful use can detect burrs only 0.0002 in. tall, but it cannot determine burr thickness. Establishing a deburring standard for a job shop doesn’t have to be a complicated task. The key is clearly stating the design, manufacturing, and inspection requirements so that no individual in the production process has any questions about what is expected. Actually creating a deburring standard is a good exercise as well for those shops that have yet to formalize work procedures. It’s a tool that can be used to boost quality and impress sophisticated OEM customers that may be looking to expand their metal fabrication supply chains. This summary details the type of deburring methods that might be available in a shop and the corresponding calibration and training requirements. LaRoux K. Gillespie is the author of SME’s Deburring and Edge Finishing Handbook.